A St. Paul playground is being dedicated today to police Sgt. Gerald Vick, who was killed in the line of duty three years ago next Tuesday. The public is invited to attend the dedication at 4 p.m., when a plaque will be placed at Margaret Recreation Center, 1109 Margaret St. A short memorial service will follow, police said. Sgt. Vick was gunned down while working undercover on May 6, 2005. The suspect was later convicted of first degree murder and sentenced to life in prison. For those that care about the truth, remember, Al Franken paid state and Federal Income taxes on EVERY penny he earned. This even included an 11 cent residual check for crying out loud. However, due to an accounting error, he over paid in one state, while underpaying in others. A scofflaw would say pots right. But Al Franken is a responsible leader, so he didn't wait. He piled through the returns and cut a bunch of checks to make everything right. AND he didn't hide. If only our current Senator, who has an outstanding complaint in California, had as much character. I've known Mike for over 20 years. We met at the Sears Auto Center in Brookdale. He was one of the best mechanics we had, I was a service advisor. We became good friends. Soon after, he dated a gal I went to high school with. When they decided to 'tie the knot' Mike asked me to be his best man. It was an honor for me to say yes. Over the years we have stayed in touch through many trips to Rock Bottom. He was a far Right big 'L' Libertarian, which made for some pretty intense political discussions. He labeled me a Commie more then once *laughing* but it was all in good fun and appropriate context. The Doctor, Jonny, and I never fail to tip one back for Mike whenever we are together. Tonight I will make a special toast, to my good friend and political sparring partner. He is deeply and truly missed! That seems like a pretty crystal clear pro choice statement to me. Or is it more like "We don't want government making your health care decisions, accept when we want government making your health care decisions. To our readers: King is in the hospital at this time and won't be blogging for a while. We'd talked Saturday morning - he'd landed in the hospital then with some stomach problems. He's on a restricted diet so stomach issues cannot be ignored. He was feeling better and they could find no source of the problem. He came to the Twin Cities to do his afternoon radio show, drove back to St. Cloud only to return to the hospital on Saturday night. Tests run today indicate his problem is his gall bladder. All my hopes to King and the Banaian family! this is the Minnesota Republican Party we're talking about. You know, the one that is under investigation by the FEC for years of financial mismanagement. The same organization who retaliated against their own Finance Director who wrote a letter to the party's Executive Committee complaining about the party's accounting practices, including questions about whether employee retirement money was misappropriated and whether the party was - gasp! - guilty of tax evasion. The same organization that continues to file - over and over and over again - statements that it hasn't been able to sort through their own finances enough to figure out where all the money went. The same organization that has racked up legal fees as high as $17,000 in a single month trying to stay out of trouble. The same organization that has been the recipient of a whole series of FEC letters asking about why they can't keep track of their money. There's a bit more, but that is enough to make Al Franken look like an accounting genius. So go ahead MNGOP, take as much rope as you need. View a rare, original copy of the Declaration of Independence at the Minnesota History Center, May 6-18, coinciding with Minnesota Statehood Week, which commemorates the 150th anniversary of Minnesota becoming the 32nd state of the Union. This copy, known as a “Dunlap Broadside,” is one of only 25 remaining original copies of the Declaration printed on the evening of July 4, 1776, at the shop of Philadelphia printer John Dunlap – and the only one that travels for exhibition. Generally, there is an admission fee, but the document will be on display free of charge. Be sure you make the necessary arrangements to stop by. Thank you for ordering tickets from Rush ticketing. Soon to arrive in the real mailbox. Last Fall I made the comment, "I MUST see this show again!" and that is exactly what will happen. Mostly the same Setlist, but some very positive adjustments, like Red Barchetta and some 2112. Last year i had to wish my Summer away, this time I get to wish the school year away. Much more satisfying! "What's this 'public policy' thing," you may ask, "and what is it doing on a political blog?" Yeah, I know. Guilty as charged. There are definitely sites and writers out there who focus heavily (in some cases, to a fault) on partisan politics with absolutely no regard for the meaning of what those political games lead to: public policy. Legislation. Laws. The things that govern the way members of our society deal with and treat each other. Those writers' (after all in some cases, it's not really fair to call them "bloggers") motivations are theirs, but even on a site with "Campaign" in its name, it's important to talk issues. Especially when a local newspaper's editorial board pens a piece entitled "Socialized health will be good for small biz". Game on as they say. Remember when the Smear boaters came out and slimed the honor of John Kerry. While President George Bush sat back and repeatedly praised Kerry for his honorable and brave service to this country, the smear boaters slurred, deceived and distorted his record. Now we begin the Same ole Same ole. McCain sent a letter to Daves, asking her not to run the ad, which he called "offensive." "I have been committed to running a respectful campaign based upon an honest debate about the great issues confronting America today. I expect all state parties to do so as well. The television advertisement you are planning to air degrades our civics and distracts us from the very real differences we have with the Democrats," McCain wrote. "We need to run a campaign that is worthy of the people we seek to serve. There is no doubt that we will draw sharp contrasts with the Democrats on fundamental issues critical to the future course of our country. But we need not engage in political tactics that only seek to divide the American people," he wrote. “He (McCain) would prefer that we not run the ad. ‘And how did you respond?’ Well, I didn't,” Daves said. Daves argued the ad is about statewide issues, not presidential politics. “Some people want to make this about Obama, but it is about these two candidates (Perdue and Moore) who are accountable to the voters of North Carolina,” she added. Standard Right Wing Smear tactics, allow the standard bearer to take the high road while the surrogates do the dirty work. Say all you want about the slugfest going on in the Democratic Primary contest, at least they have the courage to do their own dirty work! PHILADELPHIA, April 22 -- Sen. Hillary Rodham Clinton won the Pennsylvania presidential primary decisively on Tuesday night, running up a 10-percentage-point victory that bolstered her case for staying in the race for the Democratic nomination. Sen. Barack Obama played down a defeat that did not substantially reduce his delegate lead, but the outcome only further muddled a race that has stretched on for nearly four months and has sharply divided the party. The two will meet again in primaries in Indiana and North Carolina on May 6. Too little too late, really. The math simply isn't there to make a dent in Obama's lead in either popular vote or delegate count. This campaign is all about courting Super Delegates at this point. Once they make a unified move to Obama its over. Gov. Tim Pawlenty has named Tom Sorel, administrator of the Minnesota Division of the Federal Highway Administation, to be Commissioner of the state Department of Transportation. The office Sorel has headed is responsible for the delivery of the Federal-aid Highway Program to state and local transportation agencies in Minnesota. Maybe now we can get down to the the business of fixing roads and repairing bridges. Pawlenty is holding a news conference at the Capitol at 11 a.m. Monday to announce his pick. Acting Commissioner Bob McFarlin has been leading the agency since the end of February . . . The interim leader at the Minnesota Department of Transportation hasn't decided whether to seek a more lasting appointment to the commissioner's post. Longtime agency executive Bob McFarlin is serving as acting commissioner now that the Senate has ousted Carol Molnau from the department's corner office. Gov. Tim Pawlenty hopes to name a permanent replacement by mid-March. I was not on the "can Molnau" band wagon. (funny how my detractors forget those moments). But that is history, and to make this transition during a busy and key moment int he department, seamless should be the main motivator to find a replacement. Let's hope TPaw did some arm twisting and McFarlin stays on. We'll find out at lunch time. Thanks to 'The Doctor' I will be sitting behind the dug out this afternoon. 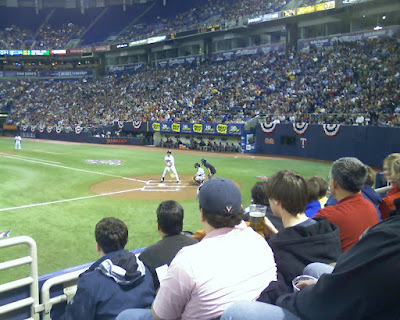 My view will look something like this: Techincally, they are Row 7, but since the dugout takes up the first three rows, well, you can do the math. Since Governor Richardson dropped out, I have remained out of the presidential nomination fray. I understand simply that either of the two remaining Democratic candidates are light years better than the Republican alternative. There are a variety of reason for that and we'll have plenty of time till November to lay them out. Now, I have hinted that I may be a leans Sen. Clinton, for one primary reason. She has been through the dirt, and the mud and the slime for so many years she is pretty immune to the attack machine on the Right. People love her or hate her. Her negatives are where they are and will remain relatively unchanged, they are a known. Sen. Obama, on the other hand, is new to the game. And where Sen. Kerry was sitting in pretty good shape right about this time, once the smear boaters got a hold of him, his polling strength diminished. I hint thahttp://www.blogger.com/img/gl.link.gift with Sen. Obama, the same thing could happen. New red meat for the Rovian Right would be a boon for them, or would it? Between the questions about Obama’s meager association with William Ayers, a former Weatherman, and the suspicions raised by his lack of a flag lapel pin, the likely nominee is slowly being turned into John Kerry. He is becoming, in other words, a candidate who may be mostly right about national security but who will lack the Red State street cred to carry his point—and the election. Hirsh mirrors my line of thinking. An electoral vulnerability at a time when the Dems should, like Sen. Clinton mentioned in the debate,simply get a free pass to the White House. You know, I wish the Republicans would apologize for the disaster of the Bush-Cheney years and not run anybody, just say that it's time for the Democrats to go back into the White House. Obama has already proven that he’s no John Kerry. For one, Obama is far more charismatic than Kerry and is far better at sounding earnest when discussing important issues – these qualities help him weather attacks and regain trust. For another, Obama is much more aggressive in defending himself, taking every attack seriously where as Kerry allowed the swift boat matter to continue unchallenged for far too long. While there are certainly voters who will stay away from Obama because they question his patriotism, I tend to think those voters would stay away from any Democrat. Much has been said about the debate in Pennsylvania. I watched the first half, and I am from the school of thought that Sen. Clinton, or anyone for that matter, should throw everything that could possibly be out there at Sen. Obama. Air every piece of slime that is known, and allow the news cycle to properly vet each and every one of them. Come endorsement time, if Sen. Obama is still standing, he will become the nominee. If not, we have a viable and electable alternative to assume presumptive status. But in either case, we must win, and it was made clear during the debate that is the commitment we were given from both candidates. But one thing I'm absolutely certain of is that come August, when we're in Denver, the Democratic Party will come together, because we have no choice if we want to deliver on the promises that not only we've made but the founders made. We are seeing peoples' economic status slipping further and further behind. We've seen people who have not only lost their jobs but now are at risk of losing their homes. We have a sharp contrast in terms of economic policies. John McCain wants to continue four more years of George Bush policies and, on the foreign policy front, wants to continue George Bush's foreign policy. So I'm confident that both Senator Clinton's supporters and Senator Obama's supporters will be supporting the Democratic nominee when we start engaging in that general election. So allow the underdog their due to point out every little imperfection of the front runner. Because we all know, no matter what Hillary, and other Democratic supporters of hers point out, it is nothing compared to what the Smear Boaters will do! With all the blathering about BitterGate, where ARE the American people on some of those key issues. This latest ABC/WaPo nugget shows us the current snapshot. Nine in 10 Americans now give the economy a negative rating, with a majority saying it is in "poor" shape, the most to say so in more than 15 years. And the sense that things are bad has spread swiftly. The percentage who hold a negative view of the economy is up 33 points over the past year, and the percentage who rate the economy "poor" has increased 13 points in the past two months. That is the quickest 60-day decline since The Post and ABC started asking the question, in 1985. Views of the Iraq war have dipped as well. Now, more than six in 10 say that the conflict is not integral to the success of U.S. anti-terrorism efforts. That is the most people to reject what is one of the Bush administration's central contentions and a core part of presumed GOP presidential nominee John McCain's stand on the issue. And for the first time since President Bush ordered additional troops to Iraq early last year, the number of Americans saying the United States is not making significant progress toward restoring civil order there has risen. Negative views of the war had eased steadily from late 2006 through early March of this year, but 57 percent in the new poll said efforts in Iraq have stalled, up six points. Moreover, while Bush remains committed to keeping more than 100,000 U.S. troops in Iraq through the rest of his presidency, 56 percent of Americans say the United States should withdraw its military forces to avoid further casualties. This has been the majority view since January 2007. On several measures, the poll finds Republicans inching away from support for the war. Among them, a sense that progress in Iraq has stalled has increased 13 points from early March, and the percentages who prefer withdrawing troops over risking more casualties (30 percent) and who think that the battle against terrorism can be a success without victory in Iraq (39 percent) are each at new highs. Results like this don't generally bode well for the incumbent party. In the White House, that is GOP, but the Dems control congress. Now the Dems control is murky and restricted, and it would take a few more votes in the Senate to truly flex their muscles. But the Electorate is generally pretty savvy, and when they switch up the White House, they like to have Congress there to keep the Commander in check. It took them a bit longer to realize that during this current administration, and look where that has gotten us. Maybe they'll let congress continue us down the path of reformation, and add a cooperative President to make sure it gets down! I'm off today, so if I stumble across anything else this AM, before venturing to my appointments, I'll be sure to share! 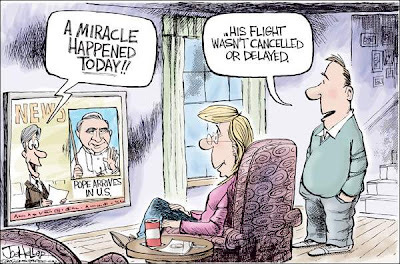 via Heller: A welcome to the Pope coupled with a little jab to the airline industry. I missed my blogging time. Dang late night hockey games. I may have something for you at lunch, until then welcome Pope Benedict XVI and be thankful for all that God has given us! If you consider yourself middle class, then you probably have a right to be upset about taxes. When you include all local, state and federal taxes, you pay a higher proportion of your income in taxes than those who make more than $400,000 a year. And those who are poor pay a rate nearly twice as high as the rich. At 39 months in the doghouse, George W. Bush has surpassed Harry Truman's record as the postwar president to linger longest without majority public approval. Bush hasn't received majority approval for his work in office in ABC News/Washington Post polls since Jan. 16, 2005 — three years and three months ago. The previous record was Truman's during his last 38 months in office. Now, the Republicans are going to on one hand, campaign on more of the same, but the other, whine that Bush isn't running again and all the Dems are doing is running against someone who isn't on the ballot. What those of us that pay attention know, is there isn't a difference. The Democratic Party is running against the failed and flawed policies of the Republicans. Following 8 years of peace and prosperity we now face war and economic tumult. The Right will use smoke and mirrors to hide that reality. They will revert to personal attacks and internal meme polling. They will steer far and clear from any attempt to debate the issues. They know what the rest of us know, that they are wrong on just about every one of them. Now that the people have that figured out, it will cost them the White House, like it did the House and the Senate.. I ended up on Random House's book mailing list not to long ago. Every few months or so a new morsel is on my stoop. I few weeks ago I received the best one so far. It is Glenn Greenwald's latest and it is released today. Myth: The Republican nominee is an upstanding, regular guy who shares the values of the common man. Reality: He divorced his first wife in order to marry a young multimillionaire heiress whose family then funded his political career. Myth: Republicans are brave and courageous. Reality: It’s a party filled with chicken hawks and draft dodgers. Myth: Republicans are strong on defense and will keep us safe. Reality: They prey on fears, and their endless wars make America far less secure. Reality: Soaring deficits, unchecked presidential power, and an increasingly invasive surveillance state are par for their course. Some of the books I have received off the mailing list I have doled out to others, or have become door stops. Not this one. Vikings right guard Anthony Herrera had three items on his to-do list when he woke up March 26: 1, Become a stronger, more well-conditioned NFL player; 2, Attend a scheduled appointment with coach Brad Childress; and, oh yeah, 3, Become a U.S. citizen. Childress congratulated Herrera and asked who was accompanying him to the big event. Herrera said, "No one but me." His wife and young daughter were in Mississippi. His mother was in Florida. And Herrera hadn't even thought to bother his teammates by asking them to join him. "I said, 'Anthony, you can't get sworn in as a U.S. citizen and not have anyone with you,' " Childress said. "I said, 'Shoot, give me a minute. I'm going with you.'" Read the whole thing. It is perfect for a positive Sunday read! DEMOCRAT grandees Jimmy Carter and Al Gore are being lined-up to deliver the coup de grâce to Hillary Clinton and end her campaign to become president. Falling poll numbers and a string of high-profile blunders have convinced party elders that she must now bow out of the primary race. "They're in discussions," a source close to Carter told Scotland on Sunday. "Carter has been talking to Gore. They will act, possibly together, or in sequence." An appeal by both men for Democrats to unite behind Clinton's rival, Barack Obama, would have a powerful effect, and insiders say it is a question of when, rather than if, they act. When not if. Hmmmmm, do they wait till PA, or not risk it and come out early next week to sway the electorate in case Hillary decides to wait it out. I do think it is time she suspends. This will give the GOP the opening they need to begin their Smear Boat campaign. If Obama can withstand that, he'll be just fine. If not, we have the Super Delegates to bail us out at the convention. Bonoff is onstage right now withdrawing, and congratulating Ash Madia and his staff and supporters. Congratulations to the Madia campaign and a world of respect for Terri Bonoff and her supporters. Bonoff hopes for a no endoresment and a trip to the Primary. Madia hopes for a clear and convincing victory within a couple 3 ballots. Anything can happen and it should be an interesting political afternoon. 9:20 A.M.: I want to thank the 3rd CD DFL and John Stiles and Kelly Schwinghammer at the Minnesota DFL for providing me with blog credentials for today’s convention. Not quite how they do it at Republican CD conventions. If others are reporting, let me know in the comments. Where Does Ones Freedom End . . .
. . . and anther's begin! According to court documents unsealed this week, the teenager said during her call to a local domestic-abuse hotline that she was taken to the ranch by her parents three years ago and shortly afterward was married "spiritually" to a man three times her age who physically and sexually abused her. Caver of the Texas Rangers said that when he and other officers arrived at the ranch on April 3, he told the ranch's overseer, Merril Jessop, that they would execute the search warrant "at whatever cost that may be." But Caver said he told Jessop he wanted to do it "in the most peaceful, respectful way I could, to avoid destroying their property." Caver said that all the buildings on the sprawling 1,700-acre compound were searched for children and that he asked sect leaders to unlock the temple and the gate on the 10-foot-tall concrete fence around the building, but sect leaders refused. Authorities brought in a locksmith to unlock the fence gate, but they had to "physically breach" the temple door and every door inside the structure, Caver said. At that point, church members formed a human chain in front of the temple and then dropped to their knees as officers proceeded. I think this is a good example of when the concept of "freedom" becomes murky. What do we have freedom to teach our children? Are we free to indoctrinate them into a cult? If this is wrong, then were is the line? What rights to children have to *not* be exposed to something like this? These are the splinter type issues that can challenge any judicial system. We have 'murky lines' in many areas of debate that can become quite passionate, abortion issue being another one, death penalty, gun control, and freedom of religion. But as we see in Texas, and I hope we can all agree, that line was crossed some time ago. But that still doesn't answer the question . . . . where is the line, and who gets to draw it? Carl, Carl, Carl . . .
Two Minneapolis police officers found themselves "in the fight of their lives" Wednesday against a man who fled from them, hit them and threw one on a car. They didn't realize at first that the man was Minnesota Vikings legend Carl Eller, and they were "crushed" when they found out. Police Inspector Mike Martin said Eller sped through a stop sign in his neighborhood near Theodore Wirth Park, led police on a chase that reached more than 60 mph and assaulted officers when they tried to arrest him. Officers smelled alcohol on Eller's breath, but they won't know how much he was drinking because Eller refused to take breath or blood tests, Martin said. Police used Tasers on Eller four times and put him in a neck hold to restrain him. It remains to be seen how those considerations will play out in the more recent case involving Eller. According to North Mankato police reports, a woman called police from a pay phone at a SuperAmerica at about 2:00 a.m. on April 21, saying she'd been sexually assaulted. Capt. Wayne Hoffman, one of the investigating officers, says the woman is a student at Mankato State University. St. Peter Police Department records show that on November 14, 1988, Catherine reported having been "inappropriately touched" by Eller, who was on campus to speak to students about sobriety. Eller was never arrested or charged in connection with the incident. He declined to speak to City Pages about the case for this story; in a statement released through Andrew Birrell, the attorney who is representing him in the North Mankato case, he acknowledges that "there was a claim in 1988, but it was never charged because I was innocent and there wasn't any evidence to support the charge." Almost like he is on some 9/10 year plan. He once again finds himself facing some pretty serious charges. What a distraction from his glory days. Shame, really! Asked repeatedly yesterday what "conditions" he is looking for to begin substantial U.S. troop withdrawals from Iraq after this summer's scheduled drawdown, Army Gen. David H. Petraeus said he will know them when he sees them. For frustrated lawmakers, it was not enough. So he doesn't know what it will take, but will know it when he sees it. O . . K . . ? A year ago, the president said we couldn't withdraw because there was too much violence," said Sen. Edward M. Kennedy (D-Mass.). "Now he says we can't afford to withdraw because violence is down." Asked Sen. Chuck Hagel (R-Neb. ): "Where do we go from here?" Buy stock in WD40, the wheels on the goal posts are getting a work out! Petraeus, the top U.S. military commander in Iraq, and U.S. Ambassador Ryan C. Crocker echoed what they said seven months ago in their last update to Congress -- often using similar words. Iraq's armed forces continue to improve, overall levels of violence are lower than they were last year, and political reconciliation is happening, albeit still more slowly than they would like. I'm all for progress, and I have supported the Surge as well as this engagement all along. However, I grow weary with the rest of the electorate as it seem to be more clear each day there is no end game. However, the General did confirm the Surge draw down will continue, before a 45 day pause to re-evaluate begins. That pause will commence about the same time my son is due in country. Petraeus said he has recommended to President Bush that the planned withdrawal of the five "surge" combat brigades by the end of July be followed by a 45-day hiatus for "consolidation and evaluation." Then, Petraeus said, he would begin "a process of assessment to examine the conditions on the ground" and determine whether to recommend "further reductions as conditions permit." The President stated that the primary goal of the surge was to turn over Iraqi security to the Iraqi's by last November. Last I checked, he was only half way there. I don't think a full scale withdrawal is responsible, but neither is using our troops as pawns in a political game of electoral chess. That is what it seems like is happening. It's not that TPaw can't do math, it is inherent in the extreme Right Wing not to understand simple arithmetic. Even ScaifeNet equates a few pennies to signing checks, but this is ridiculous. Jaws dropped in the second floor offices of the Ramsey County Board of Commissioners as news of the veto of Central Corridor spread. "It makes no sense," said Comissioner Victoria Reinhardt, after several seconds of silence after a Pioneer Press reporter informed her of the veto. After confirming the news with a county lobbyist, she continued. "It was his proposal to begin with. We did everything he asked for. We reached consensus. So he vetoes himself?" When will people learn that you can't believe a word out of a typical Republican's mouth, cause what they say, what they mean, and what is the actual truth can all be completely different things. When Army Gen. David H. Petraeus and Ambassador Ryan C. Crocker travel to Capitol Hill tomorrow, they might be the ones before the microphones, but the cameras will be trained on three of their inquisitors: Sens. John McCain, Hillary Rodham Clinton and Barack Obama. Sure, Spring Break is over and the excitement begins without me. I'll be stuck looking at transcripts. That and more ScaifeNet hijinks from the Juvenile Detention Hall Kool Aid Drinkers and other not so Swift henchman. Myself, and over 18,500 of my close personal friends witnessed history last night! the Wild claimed the Northwest Division title for the first time Thursday night with a hard-fought 3-1 victory over the rival Calgary Flames. Fittingly, it was the Wild's only original player, Marian Gaborik, scoring two third-period goals to break a 1-1 deadlock and send the sellout crowd into an absolute frenzy during the final 2 1/2 minutes. And a frenzy it was. Now off to the playoffs, after we complete the regular season on Sunday. We have a Cup to win! The blogging efforts on behalf of Thune's Senate campaign didn't cause greater civic participation or bring in piles of small donations. Instead nine bloggers -- two of whom were paid $35,000 by Thune's campaign -- formed an alliance that constantly attacked the election coverage of South Dakota's principal newspaper, the Sioux Falls Argus Leader. More specifically, their postings were not primarily aimed at dissuading the general public from trusting the Argus' coverage. Rather, the work of these bloggers was focused on getting into the heads of the three journalists at the Argus who were primarily responsible for covering the Daschle/Thune race: chief political reporter David Kranz, state editor Patrick Lalley, and executive editor Randell Beck. Imagine that, a campaign paying bloggers to preasure the local press with twists and turns of intimidation. Sound familiar?!? This was me last weekend! The lovely Mrs. Flash is in the driver's seat with the hopes of a UCLA finish, son Josh has a shot if UNC can pull it off. I broke a tooth last night and have an emergency dental appointment this AM. This may be all you get today. My friendly troll commenter helped gather some information in his attempt to discredit my well documented and rock solid post on Mike's motivations as a blogger. He tends to think that blogger credibility is determined by MSM links, but he apprerently is not familiar with what a press consultant does, and what his roles is. It goes a lot further than just reprinting press releases. And we have seen from Mike's writing style he struggles with putting words together for more than a few sentences, because he must be very careful with his use of pronouns and prepositions to give himself just enough wiggle room. The more important role of a press consultant is pushing stories, calling contacts, and seeing how fast you can get the snowball to roll down the hill. No one has ever doubted Mike's ability to do his job and do it well. But since Fall of 2006 there is no hint on his current disclosure form as to what he has been doing as one who readily admits "I have spent most of my entire professional career working in Minnesota politics and public relations." Not a word as to how he is paying the bills as an admitted paid professional political consultant. "I am continually aware of my responsibility to disclose any conflict that could tarnish the effectiveness of my blog." If it only takes a few pennies trickled down after being passed through a couple different organizations to be under the control of a Left leaning partisan, what is it when that money is handed directly to someone in the form of a payroll check. Or is it, as Spotty suggests, just a tin cup that is used to keep food on the table. "Mike Brodkorb, on the other hand, gets paid lots more than 'pennies' to do communications work for the GOP and political candidates." "Mike is in the business . . . "
Yet Tom only links to an outdated, and significantly scrubbed re-edited disclosure page. So the questions remains, now that Tom has outed MDE's current funding sources, when is Mike going to honor his word and disclose who they are. I mean, he said he would: "I am continually aware of my responsibility to disclose any conflict"
Thanks again, Tom, your service is appreciated! I am taking a planned Blog break, today. I suspected the usual suspects would get all up in arms over my well documented and factually based assertions. What I didn't expected, is how their comments would so perfectly prove my points for me while providing the much needed stepping stone to my next screed. You enjoy this beautiful Spring Day, I am going to spend quality time with the Lovely Mrs. Flash as we continue our Spring Break.